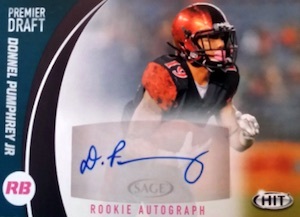 Akin to the prospect sets for up-and-coming baseball players, 2017 Sage Hit Premier Draft Series Football provides a similar collecting avenue for potential stars of the '17 NFL Draft class. 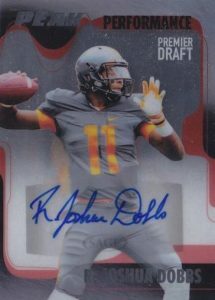 The early-season release totals 15 autographs per hobby box with Low Series and High Series editions. This is an increase from 2016, which had 12 autographs per box. The Low Series base set includes 65 cards with 40 main versions and the remainder occupied by subsets. 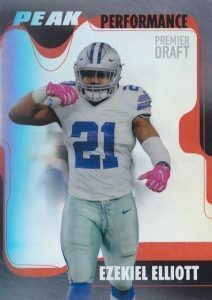 In Focus gives additional coverage to the biggest expected names in the draft while Instant Impact documents top 2016 rookies players like Dak Prescott and Ezekiel Elliott. Signed Instant Impact cards average 1:150 packs. Growing that number, High Series brings the base card total to 135. 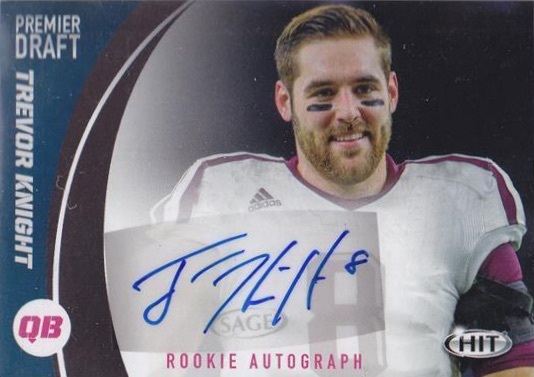 Looking to those players likely to join the NFL, 2017 Sage Hit Premier Draft Series Football understandably revolves around the many signed cards. In addition to the base Autographs, the set includes Gold Level Autographs (#/250), Peak Performance Platinized Autographs and Premium Portrait Autographs. 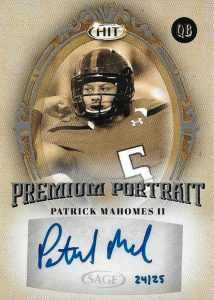 As far as unsigned inserts, Peak Performance Platinized provides a new chromium option highlighting college players at their prime, while Premium Portrait utilizes a framed design. 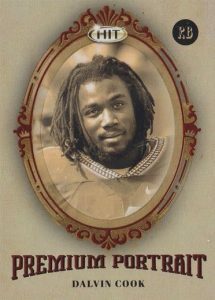 Collectors can also find one hobby-only parallel in every pack of 2017 Sage Hit Premier Draft Series Football. 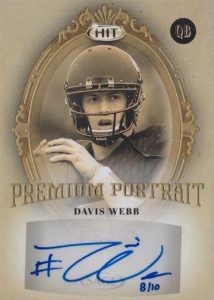 Although no specifics were provided, 2017 Sage Hit Premier Draft Series Football has "extremely limited production." The release only includes live autographs with no redemptions. PARALLEL CARDS: Parallel (1 per hobby pack). PARALLEL CARDS: Red, Black, Gold #/250. PARALLEL CARDS: Rainbow, Red, Blue, Gold, Cracked Ice. PARALLEL CARDS: Rainbow #/50, Red #/25, Blue #/10, Gold #/5, Cracked 1/1. PARALLEL CARDS: Red, Silver, Gold, Blue. PARALLEL CARDS: Red #/50, Silver #/25, Gold #/10 Blue 1/1. PARALLEL CARDS: Autograph, Autograph #/10, Autograph #/5, Autograph 1/1. PARALLEL CARDS: Red #/50, Silver #/25, Gold #/10, Blue 1/1. I do like that this, usually, give us our first scratch to that itch of getting the upcoming draft pick cards, even though they’re lower end cards. I hate that they split them up in to two series. By the time the High series comes out, I can already scratch that itch with higher end/quality cards and no longer care to purchase the lower tiered cards such as these. 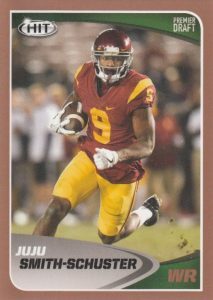 Ugly plain drab cards.i bought some of the sage football card and now wish i had not! I shelled out 20and bucks on them and got a box full of copys. I got 2to to 4go cards excatly alike except for 6u of them. They are plain and just flat. Don’t really care too much if the cards don’t have logos or licenses etc… I’d say I def. got my money’s worth, esp. because I got the box on sale for $56!